This is the cheapest and least contaminating way to transport large quantities between distant points. GTFco has agreements with all big shipping lines in the World and let offers Our customer’s optimal solutions for every need . Furthermore we offer the option to book full containers (FCL Full Container Load) or just a part of it groupages (LCL Less than a container load) for ports of origin destination selected by customers. 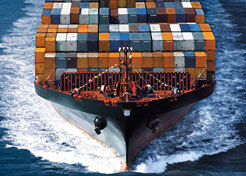 Extensive experience also leads to transporting perishable products door to door. Advice on loading, temperature control, humidity packing systems, handling and quality control at final destination. Also give involving dangerous product services. GTFco is also concerned with project cargo. From good out of gauge to whole projects as moving a factory from origin point to a final destination, being present in the coordination of cargo, special machinery for lift handling, etc..